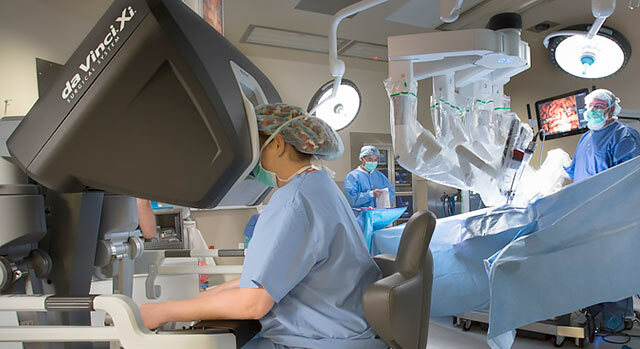 Surgeons at Summerlin Hospital Medical Center use the da Vinci® Surgical System. This advanced robotic platform allows doctors to perform complex procedures using smaller incisions than standard surgery with small tools operated robotically. This may result in less pain, scarring, trauma and blood loss than other surgical procedures so that people can potentially return to work and daily activities more quickly. Robotic surgery is a minimally invasive procedure. During a robotic surgery, small incisions are used, which may result in less post-operative pain, reduced blood loss, less need for blood transfusions and a potentially faster recovery time. The two major drawbacks of conventional laparoscopy (without the use of robotic instrumentation) are that it relies on the use of rigid, hand-held instruments, and visualization is provided by a standard 2D video monitor rather than a 3D field. While standard laparoscopic surgery is performed using small incisions, the surgeon's depth of field, dexterity and precision may be variable. You can also send us your questions about the da Vinci Surgical System and the Robotic Surgery Institute at Summerlin Hospital.